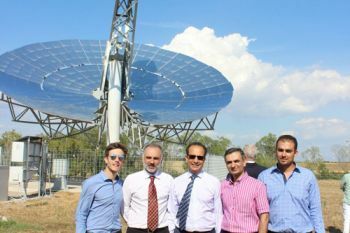 Professor of Energy Engineering, Professor Naser Sayma, and colleagues have completed and tested the technology in Italy. Engineering academics at City, University of London, have successfully developed state-of-the-art micro gas turbine technology operated by solar power which can generate up to 6kW of electricity. The Optimised Microturbine Solar Power system (OMSoP), is led by Professor of Energy Engineering, Professor Naser Sayma. The OMSoP project, co-funded by the European Union's 7th Framework Programme for Research and Development, aims to provide and demonstrate technical solutions for the use of state-of-the-art concentrated solar power system (CSP) coupled to micro-gas turbines (MGT) to produce electricity. The intended system will be modular and capable of producing electricity in the range of 3-10 kW. Professor Sayma recently chaired OMSoP’s final meeting in Italy. The engine is located at the focal point of the dish and converts solar power to thermal energy at temperatures exceeding 800 degrees Centigrade. This heats compressed air before it is expanded in the turbine to generate shaft power, which drives a high-speed electricity generator operating at speeds of 130,000 revolutions per minute. 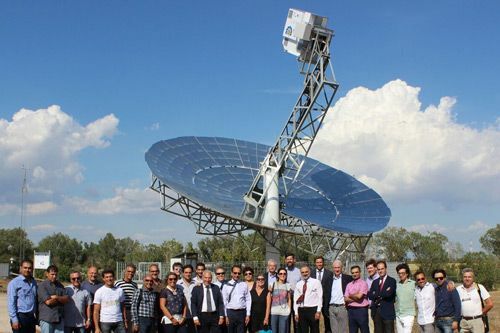 After four and a half years of hard work from a consortium of eight member organisations, the demonstration plant has been completed and tested successfully in Italy and is currently generating electrical power. Data is currently being collected for characterisation and input for future development towards the commercialisation of the technology. “Funding from InnovateUK and China’s Ministry of Science started this April and is aimed at integrating the system with thermal energy storage, allowing the operation to run without back up from the grid. The system can then work independently and is suitable for distributed power generation. This minimises the requirement for expensive grid infrastructure." “The technology we are developing can also be used to power schools, hospitals and other facilities in remote locations, particularly in developing countries with plenty of sun shine”, he adds.